Jonathan Kravetz! – Oh, Bernice! 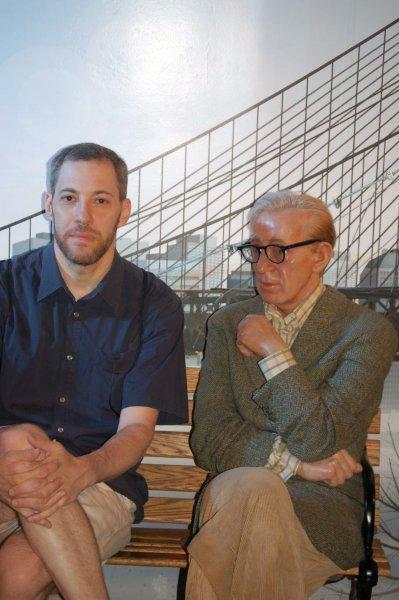 Jonathan Kravetz, close personal friend to (the wax) Woody Allen, is our third and final reader tomorrow night! As you’ll read in his bio below, he gives you permission to pretend to know him, but show up at the reading tomorrow night and you’ll have to do a little less pretending. See you all there! Jonathan Kravetz is the founder and Editor-in-Chief of DUCTS.org, a biannual literary webzine devoted to publishing engaging personal essays, memoirs, art, fiction, humor and more. His plays have been produced in New York City, Dallas, and in Brighton, England. He holds a Masters in Cinema Studies from NYU and is currently pursuing his MFA at Queens College where he was a Louis Armstrong resident last year. He teaches dramatic literature at FIT and runs the monthly Trumpet Fiction reading series at KGB Bar in the east village. Jonathan is working on a series of plays for puppets and actors inspired by the work of Sigmund Freud, and he likes to comb his hair and shower in the morning. His play, Insomnia, is a semi-finalist for the Eugene O’Neill Playwrights Conference this year, so feel free to pretend you know him. This entry was posted in Upcoming Events and tagged Jonathan Kravetz. Bookmark the permalink.